Becoming a parent opens up a whole world of financial stressors beyond those that many people are already dealing with. Worries like medical bills or education costs or simply trying to keep your child clothed can keep parents up all night. And while bills and budgets will always be a part of our lives, a new study is warning parents that too much financial stress can actually play a role in how your child's brain develops—and it may not always be a good thing. 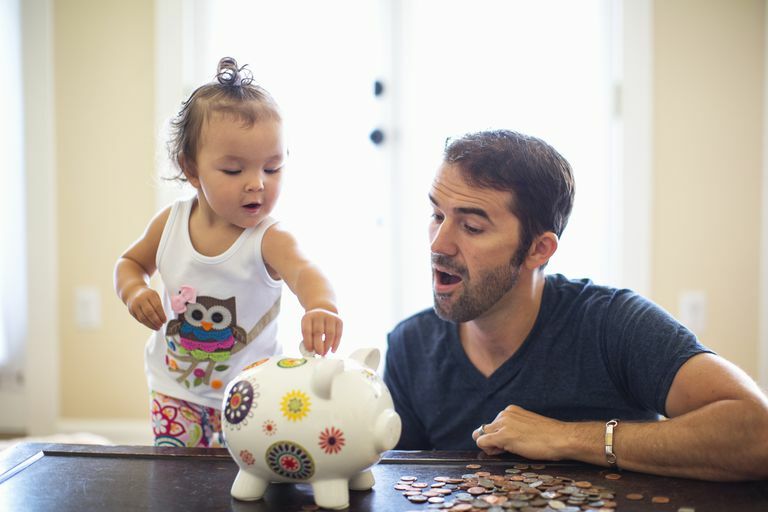 Previous studies studies have found that financial woes can have a negative impact on the way a toddler and baby's brain develop for a pretty straightforward reason—families in lower socioeconomic classes, in general, have less time to spend with their kids freely. Children of financially-strapped families tend to actually hear less words spoken during their early formative years, which in turn, starts them on a path of delayed development through their childhood. Other studies have linked stressing about money and other financial-related factors to low birth weights in babies, so the link between money and brain development most likely starts very early on in life. The stress of poverty on parents can mean that their own brains are changed and that will impact how they parent and the messages they send their children, too. For example, previous studies have found that poverty changes the way adults think about the future. The constant stress can hurt an adult brain's ability to plan long-term or set goals. Poverty can lead to living fully in the present, which might mean less long-term financial planning or educational planning for children especially. Additionally, stress affects health—the effects of the stress hormone, cortisol, can cause long-term health problems and lead to complications such as obesity. A 2016 study has shown that family poverty also impacts a child's brain in other ways, too. The study from the University of Granada looked at over 88 toddlers and found that being from a family in poverty affected their brain function. Specifically, families who had less economic resources generally also had lower levels of education, which in turn affected their children. The researchers in the study used simple puzzles as a way to test error recognition. They explained that the way the brain works in a toddler at this age is actually a pretty accurate representation of how the brain will work in an adult, too, so it's a good judge of how well the brain can work for this task. The link between recognizing errors at this young age can tell researchers a lot about how a teenager or adult may be able to identify risks later in life, or have issues with attention problems. They found that the toddlers from more impoverished families displayed more immature functioning and couldn't detect errors as well as other children from more economically stable families. The study stated that financially-challenged families show poorer activation of the executive attention network, which can be of great help for the early detection of risk for developmental disorders involving deficits in this function of the brain. Basically, this study displays what researchers and early childhood experts have already known: that children who grow up in impoverished families face more developmental and learning challenges for many reasons. Not only are they exposed to a wider variety of stressors at home, but they may have less access to resources—such as education—that can help their brains develop, or even less access to the help they need for certain medical conditions that may impact learning and development. This study also proves that poverty doesn't just impact the external environment of a child, however; it shows that poverty literally changes the way that a child's brain develops, putting him or her more at risk for educational challenges and risk behaviors down the road. The study points to the importance of ensuring that all children have access to early childhood education and resources that can help ensure that brain development starts early for the best chance at success in the learning environment.